150-S8M-896 STS Supertorque Belt | Synchronous Belt 150-S8M-896 | Contitech/Bando S8M-896 x 15mm W.
150-S8M-896 Supertorque STS. Consumer Brand. SPEC: 8mm Pitch X 896mm Length OC X 15mm Width. 112 Teeth. Replacement “STS Series” industry standard Synchronous Belt. Replacement belt for fitness equipment and power tools such as CNC Machines, woodworking tools & lathes, pumps, and robotic equipment. Synchronous Belt 150-S8M-896 - (Metric Standard). Contitech/Bando S8M-896 x 15mm W Synchronous belt. 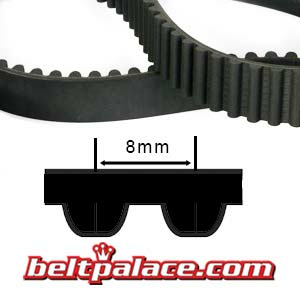 896-8M-15 (HTD) Industrial Timing belt. Premium 8mm Pitch X 15mm Top Width X 896mm Length OC X 112 Teeth. Acron S-TEKNIC 896-8M for Aerodyne/(Schwinn) Airdyne Fitness Bikes (15mm wide) for CrossFit competitions. 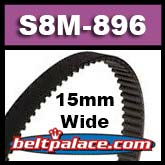 Synchronous Belt: 8968M15, Round tooth profile.